Great Britain Standard Life Men remained the only unbeaten team in the tournament when they squeak past the resilient Hungary squad, 66-64, in the ongoing EuroBasket Qualifier played at the National Indoor Arena in Birmingham. Former NBA player Pops Mensah-Bonsu had another terrific night as he scored 15 points and grabbed 17 rebounds, highlighted by crucial free throws down the stretch that sealed their fifth win in as many games. “I thought Pops was outstanding, he was carrying us at times and Nate was good early. I thought the key tonight was Pops’ rebounds, they won us the game.” GB Head Coach Chris Finch said. Veteran Nate Reinking, who at 36 is the oldest player in the team, scored 17 points and added five rebounds, while Chicago Bulls forward Luol Deng chipped in 13 points and grabbed four boards. Great Britain dominated the entire first half and built a 37-22 lead at the half, but the Hungarians mounted a spirited comeback in the second half, erasing GB’s lead with a big run. Hungary tied the game at 64 in the final minute of the game but Mensah-Bonsu and Deng shut the door for the visiting team. “We were fortunate to get out of here with a win tonight. We’ve got a few days to work on stuff prior to the game in Macedonia.” Finch said. 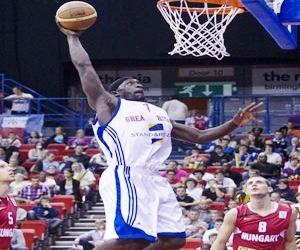 The win assured Great Britain of at least the second place in Group B, which made them closer to their goal of qualifying in the 2011 EuroBasket that will be played in Lithuania.